My poor friend B has come down with a case of bronchial pneumonia. This is an illness I know well, as I had it a few years ago. I wanted to send her something nice in the post to put a smile on her face. Biscotti has been on my list of things to try out for ages. They seemed like the perfect solution as they keep so well and would be able to stand up to being posted across the country. 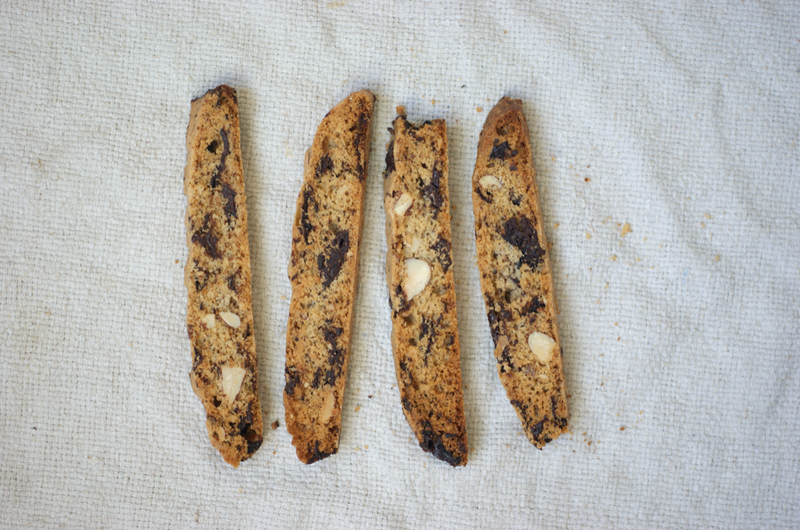 The whole process of making biscotti is fascinating. I really didn't believe that the first dough would bake up into loaves - it was much wetter than I expected and almost like a cake mix. Then magically it doubled in size and became hard in the oven. I'm excited about all the possibilities. 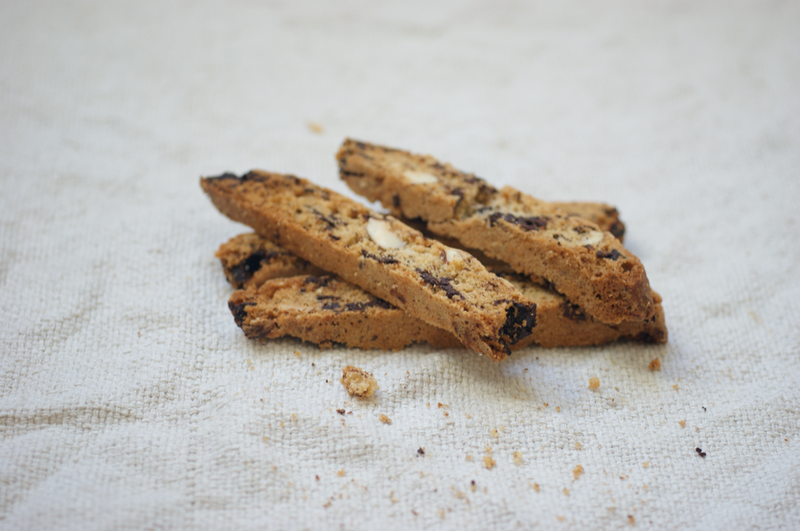 Homemade biscotti taste a lot nicer than the ones you get in chain stores. They're also not so rock solid. I don't think the brown butter is a normal inclusion in biscotti but the recipe said to cook until 'golden' so I thought I might as well keep going for a moment longer as the nutty flavour adds so much to baked goods. Preheat the oven to 180C/350F. Line two baking trays with baking parchment. Put the butter in a small saucepan over medium heat and melt. Keep heating until the butter foams up, starts to form golden brown speckles and has a wonderful nutty smell (see here if not familiar with making brown butter). Pour into a mixing bowl and place in the fridge to cool. Toast the almonds in the oven on a baking tray for 5 minutes, then roughly chop them. Whisk the flour, baking powder and salt together in a separate bowl. Add the sugar and vanilla to the brown butter bowl and whisk to combine, then whisk in the eggs. Stir this wet mixture into the flour, followed by the chopped chocolate and nuts. At this point it seems quite wet for a cookie dough. Divide between the two baking sheets, spooning into two log shapes roughly 30cm x 10cm. Bake for about 20 minutes or until golden brown, puffy and firm to touch. Remove and leave to cool for 30 minutes on a wire rack. Preheat the oven to 160C/320F. Carefully slice the logs with a serrated bread knife into 1cm slices (you can use a 45 degree diagonal to get longer biscotti). 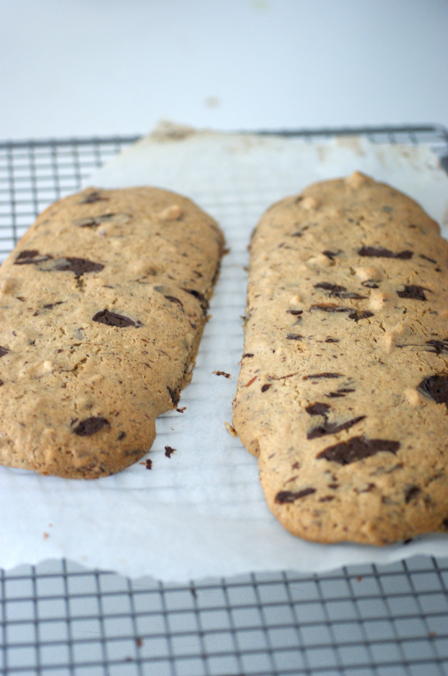 Place the biscotti back onto the baking sheets (cut side up) and put back into the oven for a further 10 minutes. Remove from the oven and turn over. Bake for another 3-5 minutes. They should be golden brown but not too dark (I take them out a touch lighter than the pictures now). Cool on a wire rack and then store in an airtight container. They keep for at least a week, by 2 weeks they're starting to get stale. UPDATE 10/09/17: Made these again and really enjoyed them. I made a 2 egg mix as it seemed simpler (previously I'd used 1 1/2) - I've changed the measurements above too. I also used hazelnuts instead of almonds and toasted them first, which was lovely. My logs took more like 20 minutes for the first bake, so I've adjusted the time. UPDATE 20/11/17: Rewritten in several place to clarify. I'm using a lower temperature for the second bake now. Again I used hazelnuts. b VERY much appreiciated the biscotti care package, totally moreish and delicious. Especially with strong black coffee (get mocha type of beans!) YUM YUM! It's truly delicious, and I never tried with chocolate but it's such a good biscuit! Emma sent some to me in Switzerland. They are truly delicious- not too sweet! The almonds go so well with the dark chocolate. I made these yesterday with the remnants of some Valrhona chocolate I recieved for my birthday. They were beautiful, slightly bitter with the sharpness from the chocolate, my family hugely appreciated them as we're all going through exams right now. Definitely on the list of things to make again! Cheryl - toffee sounds delicious but I have no idea how it would bake up in these. If you try it I'd love to know! Otherwise maybe dried fruit or more chocolate? I finally got around to making these, and they came out great! I think somehow in my conversion from SI units to American (forgive my weakness, I don't own a scale unfortunately)I had a little too much flour because my end result was more of a cross between cookie dough and cake mix but it still baked well.